“Here’s your task. Build a tiny sensor that detects a signature of infrared (IR) wavelengths characteristic of a hot tailpipe, a wood fire, or perhaps even a human being. Design the sensor so that it can remain dormant and unattended but always alert, even for years, without drawing on battery power. And build the sensor so that the act of detection itself can initiate the emission of a signal that alerts warfighters, firefighters, or others that a “signal-of-interest” has been detected. It’s just the sort of intelligence, reconnaissance, and surveillance (ISR) technology that can increase situational awareness while minimizing the need for potentially dangerous maintenance missions to replace run-down batteries. 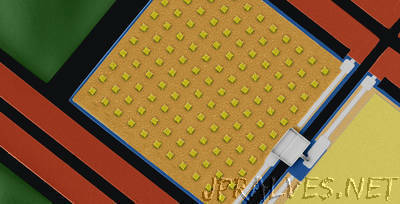 The sensor is a showcase of clever physics and engineering, including a grid of nanoscale patches whose specific dimensions limit them to absorb only particular IR wavelengths. “The charge-based excitations, called plasmons (that can be thought of somewhat like ripples on the surface of water), are highly localized below the nanoscale patches and effectively trap specific wavelengths of light into the ultra-thin structure, inducing a relatively large and swift spike in its temperature,” Rinaldi explained. These temperature spikes, in turn, lead to an upstream sequence of events that culminates in circuit-completing deformations of other parts of the sensor. Consider the identification of vehicles from their IR emissions. Engines that burn gasoline or diesel fuels emit specific compounds in their exhaust gases. Among these compounds are CO2, CO, H2O, various oxides of nitrogen and sulfur (NOx and SOx, respectively), and hydrocarbons such as methane. “As a result, the infrared emission spectra of the heated tailpipe gases coming out of vehicles such as trucks, cars or aircraft can by themselves act as a signature specific to a vehicle type,” explained Zhenyun Qian, who has been working with Rinaldi and other research team members on the N-ZERO program. A primary goal of the N-ZERO program is to develop fundamental technologies that open the way to new and more capable sensor systems relevant to national security. The NU team points out in its Nature Nanotechnology paper that the same technology could become important over the coming years as the Internet of Things expands to include hundreds of billions of devices, ranging from cars, to appliances, to remotely deployed sensors. “The capability of consuming power only when useful information is present will result in nearly unlimited duration of operation for unattended sensors deployed to detect infrequent but time-critical events, with a groundbreaking impact on the proliferation of the Internet of Things,” the Northeastern researchers predict in their paper.